The “magi” were likely non-Jewish wise men or scholars of the day who studied astronomy and knew the Jewish prophecies about the coming Messiah. The appearance of a previously unseen star was seen as the fulfillment of the prophecy made by Balaam and recorded in Numbers 24:17 (“A star will come out of Jacob; a scepter will rise out of Israel.”). The passage quoted by the chief priests and teachers of the law (spiritual leaders of the Jews) is found in Micah 5:2, 4. 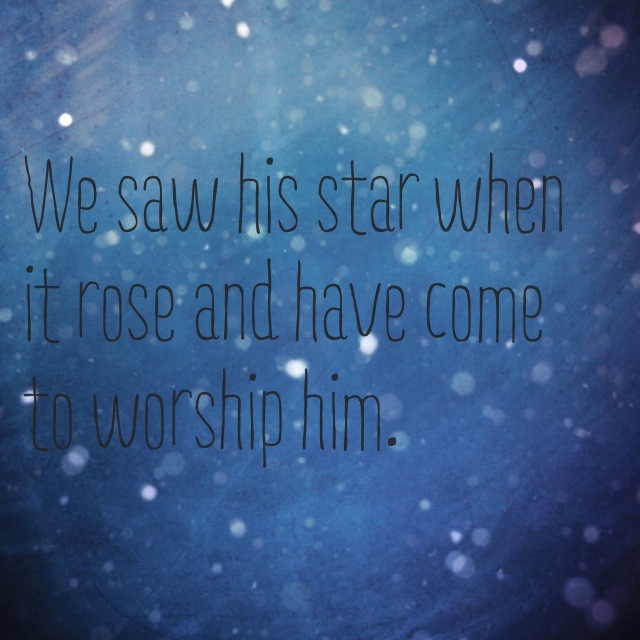 How do you picture the magi responding when they first saw the new star in the sky? Did they know right away? Did they doubt? Why do you think “all of Jerusalem” was disturbed by the news that the magi saw the star and came to worship the new king? What do you think the response of the chief priests and teachers of the law was when they heard the claim of the magi and advised Herod of Micah’s prophecy about the birthplace of the Messiah? How would you have responded if you had been a Jew and were present when the magi explained what they had seen and why they had come? Oh, God, I worship you. I want to be someone who, as soon as I am aware of your presence, lifts my hands, laughs with joy, and exclaims your praise. Let every star, every sunrise, every breeze, every smile, every storm, every pair of eyes, every snowfall, every breath lead me to worship you. Lord, let all that I see as good and all that I see as suffering lead me to my knees in worship. You are my King. The King. The one predicted by the mouths of prophets, the stars in the sky, and the hearts of the faithful. My heart calls out and longs for you alone.